Natural External Catheter by Rochester Medical 38301, 38302, 38303, 38304, 38305. Natural Catheter by Rochester Medical is an External Catheter that is constructed with soft silicone. This non-adhesive catheter is ideal for Incontinence Care or Urinary Care where the catheter patient must change their Male External Catheter several times each day for intermittent catheterization. 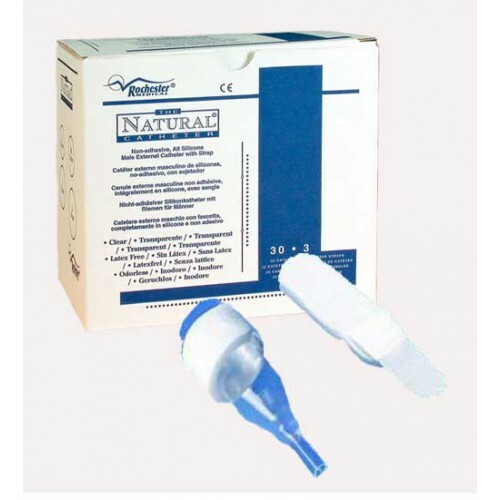 The Natural Catheter is less intrusive and facilitates frequent changes. Each box of Natural Catheters come with three adjustable and reusable foam straps that hold the Natural Catheter in place. The Natural Catheter from Rochester Medical is available in five different sizes to meet individual patient needs. Superior breathability enhances comfort and optimal skin integrity. This Rochester Male External Catheter has a clear sheath for easy visual inspection of skin. Reusable foam straps for secure placement. External Natural Catheters that are Latex-free and PVC-free. We do not offer samples to customers. It's best to contact the manufacturer for sample requests. Ordered a box of 30 Bard male catheters for my incontinence after prostate removal. My order was delivered very quickly and came with two tie straps and good instructions as this was my first experience with male catheters. They were packaged in a convenient box with a catheter sizing gauge. I will order again as I am well pleased with price, delivery and quality. We have been using these catheter's nightly for about a week on my father in law who suffers from incontinence from Alzheimer's. I'm thrilled to say that he is now waking up dry and his bedding, pads, etc. are not soiled. This has cut down on my having to bathe him daily (which he hates) and doing his laundry daily which takes hours. The only downside to this product is that we definitely have to use the Velcro strap (purchased separately) to keep the catheter on him or else it falls off by morning and he ends up wet. Also, the Velcro strap has to be placed on him tightly so getting positioned correctly took some getting used to. I also purchased a large 2000 ml drainage bag which was smart, because he tends to fill the entire bag by morning. So far, these products have been a real lifesaver for us! It is easy to use, but would be better if it had adhesive.